The Bride's Choice for Romantic Elegance! Get A FREE Brochure from "The Historic Shelton"
Fully restored, this grand landmark set in the countryside amidst golden field’s features traditional bridal staircases, cathedral windows, complete gourmet kitchen, groom’s room and luxurious powder rooms. 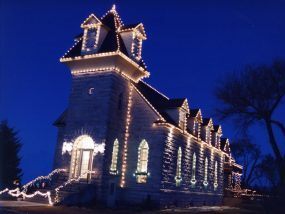 Enchanting memories await you and your guests at the beautiful Historic Shelton Church Wedding & Reception Center. Our friendly staff is eager for you to see for yourself the natural beauty & warm interior ambiance of Shelton. Call for a tour, very flexible hours. Please mention that you saw this on SoutheastIdahoBride.com.